The Transport Sector Retirement Fund (TSRF) today announced its support of the 2019 Hollard Highway Heroes competition to search for South Africa’s best truck driver. The TSRF was represented by Mandla Nkosi, a member of the Fund’s board of trustees, at the official launch of the Highway Heroes competition in Johannesburg. The TSRF is acutely aware of the occupational demands placed on its members in the transport industry. The Fund provides retirement savings for 70 000 members from 3000 employers earning their bread and butter in this industry. “The majority of our members, at least 70%, are truck drivers, transporting goods on our country’s road networks,” said Joe Letswalo, the Transport Sector Retirement Fund’s principal officer. Truck crashes cost the transport industry up to R 18-billion annually and have a devastating effect on individuals, their families, transport operators, aligned industries and indeed the whole country. “Four years ago, we determined that good-quality truck stops are sorely lacking along SA’s major transport nodes, and given that a major cause of road accidents is driver fatigue, we launched a strategy to ensure that our members, and indeed the broader transport community, would have transport facilities to park and sleep safely,” explained Letswalo. The TSRF entered into a 50/50 joint venture with the Deysel Family’s Highway Group to expand the Harrismith Highway Junction Truck Stop into a multi-brand, high-end park and sleep facility providing auxiliary services to truckers which include restaurants, primary healthcare and recreational facilities, warehouse space and a vehicle service station (workshop). The Highway Junction Truck Stop is now the biggest and busiest facility of its kind in Africa. Following its success, the TSRF is in the process of developing similar hubs along major routes throughout the country. Sites have already been earmarked near Cape Town, East London, Colesberg and Musina for project completion during 2020-21. “Our investment in truck stops brought us closer to our members and provided a keen understanding of the challenges they face. In this regard, their safety is always top of mind. In an attempt to facilitate the sharing of knowledge and enhancing overall road safety, the TSRF entered into a partnership with Arrive Alive to support the transport sector through pro-active measures to mitigate the risks our members face daily whilst performing their duties,” continued Letswalo. This partnership brought the TSRF to Hollard Highway Heroes Competition. For the first time since the inception of the competition in 2015, the Hollard Specialist Insurance Company, Hollard Trucking (this year) opened its Highway Heroes competition to all truck drivers in South Africa, affording the Transport Sector Retirement Fund and other partners the opportunity to come on board to recognise trucking excellence. For the duration of the competition, the driving behaviour of entrants in the competition will be closely monitored by the Hollard Trucking Bureau through the utilisation of fleet tracking technology. Through careful monitoring, a pro-active driver-centric approach is followed to manage risk from speeding to fatigue, harsh braking patterns and other high-risk alarms to ultimately improve driver decision-making and actions. Entries to the competition are now open and will close on 31 May 2019. Thereafter drivers will be monitored until 31 July when the top 50 drivers will be chosen and monitored again for a further 45 days. The winner will be announced on 14 November 2019 and will walk away with R 100 000.00 in prize money. 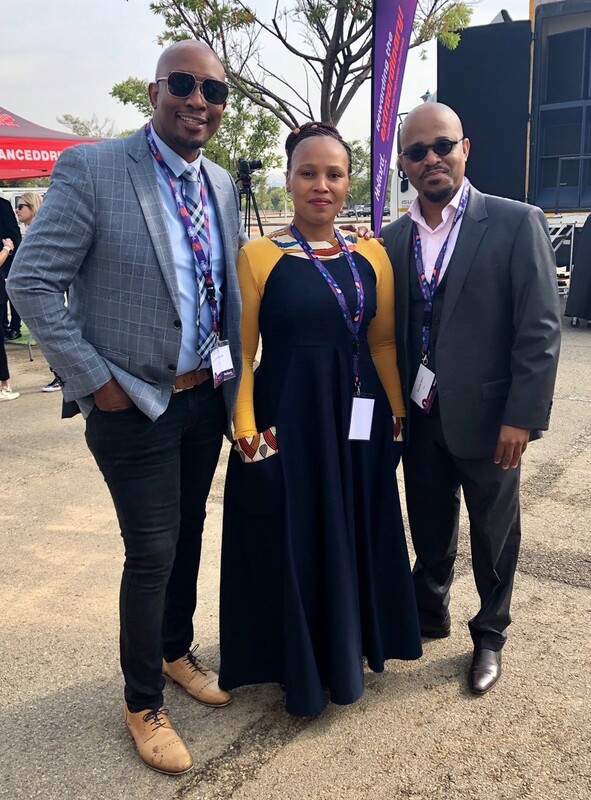 Caption: Television presenter, MacFarlane Moleli with the TSRF’s Notokozo Mabusela and Mandla Nkosi at the official launch of the Hollard Highway Heroes competition.